Use this satin pillowcase for hair that’s more beautiful and less prone to bed-head messiness. Hair glides across the surface, helping to prevent knots, breakage, and flatness—and prolonging the life of blowouts, too. Satin doesn’t absorb moisture like cotton does, so your strands will look healthier and shinier. Dimensions: Each: 20" x 30" x 0.01"
I love my satin pillowcases. So glad I ordered this on a whim....absolutely love them and they washed up beautifully. Kamela Hurley heard the buzz about the benefits of using a satin pillowcase for hair that stays shiny. She tried one out that felt less-than-luxurious, so like any good Maker, she decided to create her own. 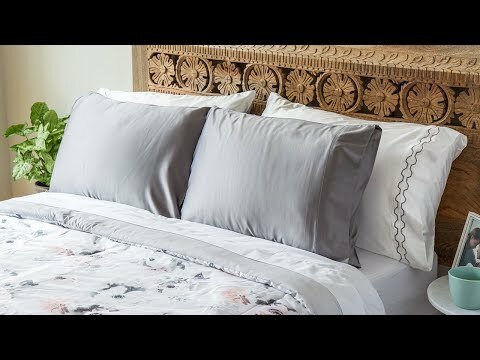 After finding the just-right fabric, Kamela gave her DIY satin pillowcase a try—and was amazed to wake up without any bed-head or face creases. She started Madison & White so other ladies could share in the same rise-and-shine delight. Satin is a smart choice for hair because it is so smooth, strands glide across the surface. And because the fabric doesn’t absorb any moisture (like cotton does), it won’t dry out hair or skin. 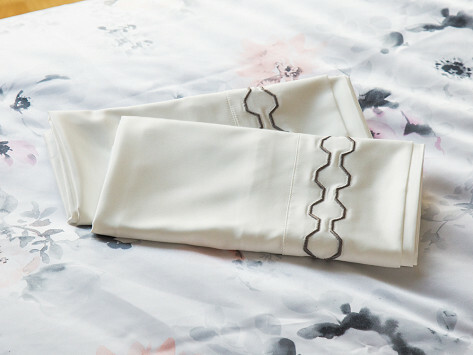 Kamela also created a bamboo pillowcase to boost healthy skin. Bamboo is naturally antibacterial and breathable, so it thwarts dirt, oil, and germs while you catch up on your beauty sleep. The set of cases are embroidered with the days of the week to remind you it's a good habit to change them more regularly—and to give your face an ultra-clean spot to rest.